While it’s tempting to sip drinks by the fire or watch movies all winter long, it’s also important to get moving and get a bit of exercise now and then. Everyone has their own workout preferences, but one thing’s for sure: you don’t need to fork over piles of cash to a gym or personal trainer to have fun, beat the winter chill and get in great shape. These low-cost workouts can keep you moving all winter long and right into the spring. Of course, before embarking on any exercise program, check with your physician to see if you have any limitations. Ready to get your sweat on? Baby, it’s cold outside. Depending on your climate, you might prefer a warmer workout environment. Try one of these indoor options to get in shape when it’s just too miserable to be outside. YouTube is more than just a place to watch viral videos. 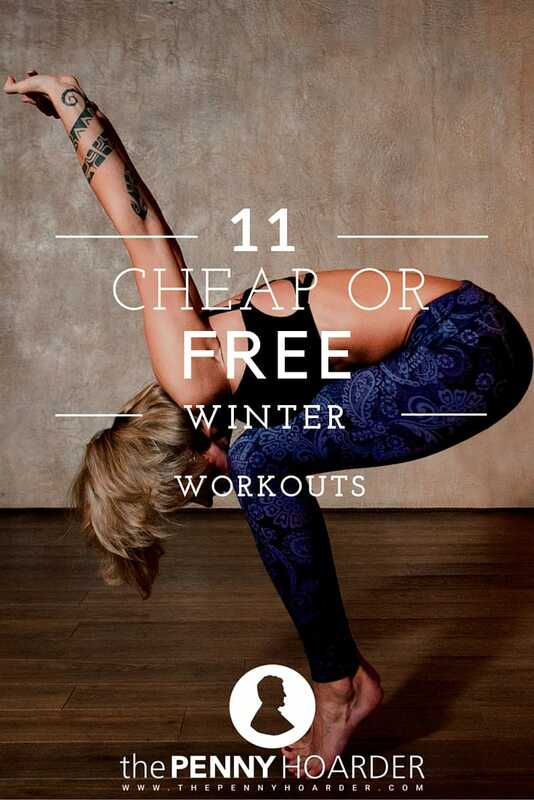 It’s also a great site for free workouts you can do right in your living room. While YouTube is a great way to get a workout, sometimes it’s better to get out of the house. 24-Hour Fitness offers a variety of changing membership specials, including coupons, discounts and free passes. They also offer an e-newsletter for even more deals. Costco also offers a variety of discount gym memberships, so make sure you’re making the most of your membership. Check with your company’s HR department for deals as well. Some employers offer discounts at nearby gyms, and Blue Cross Blue Shield’s Federal Employee Program offers discounted memberships at 10,000 fitness centers throughout the country. Those with Aetna insurance can also find discounted options. Many gyms will offer a free day pass to those considering membership, and members can often bring guests for free. Ask around and see what kind of deals you can get, or if anyone may have a spare guest pass. If you’re in high school or college, be sure to ask about student discounts, and take advantage of your school’s facilities. Check your local community recreation center for affordable day rates and membership options. Some offer a wide variety of classes, and even adult sports leagues. My local rec center even has a swimming pool and a water slide! See what your local rec center offers — you may be pleasantly surprised by the options. Find a local indoor sports league to keep fit and have fun during the winter months. From basketball to badminton, many communities offer leagues for every desire. Whether bowling, racquetball or dodgeball is your style, see what indoor sports leagues are available in your neighborhood to make new friends and keep active all winter long. Many community colleges offer exercise classes, from walking to highboard diving. See what your local community college has to offer. You may even be able to put some credits towards a degree if you’re already in school. Groupon and Living Social often offer discounts on active recreation, from rock climbing gyms to laser tag. Keep an eye out for these daily deals. If you don’t want to keep track of these deals, consider getting an Entertainment Book and taking advantage of coupons for batting cages, gym passes and more. If the weather isn’t too frightful, bundle up and head outside to enjoy the wonders of winter while exercising. Be sure to dress appropriately and pay attention to how your body feels. If you feel cold or numb, or you’re in pain, be sure to get inside and warm up, as hypothermia and frostbite are dangers this time of year. Get some fresh air and sunshine along with your fill of Vitamin D. Don’t let cold and wet weather keep you inside. Bundle up, put on a waterproof layer if necessary, and go for a walk. If you’re in an icy area, consider getting traction devices, such as Yaktrax or MicroSpikes to secure your footing. Enjoy the snow with a pair of snowshoes strapped to your feet. Take a class to learn the basics, or head out with experienced friends. Pick up pointers beforehand from this video, and check out Snowshoe Magazine’s First-Timers Guide for valuable tips on selecting a pair of snowshoes (which you can can find new for $100 or less), safety tips (don’t go alone, always tell someone where you’re going and when you’ll be back), how to dress (layers are your friends) and potential dangers (including hypothermia and frostbite). If you fall in love with snowshoeing and want to go even faster, consider entering a snowshoe race. While downhill skiing can be pricey (but doesn’t have to be), cross-country skiing can be even less expensive. Plenty of YouTube videos demonstrate basic cross-country skiing methods, but it’s always best to go out for the first time with a guide or experienced friends. Be sure to take safety precautions, including dressing properly, never going alone, and letting someone know where you are and when you’ll be back. Find learning centers and instructional courses on the Cross Country Ski Areas Association website. Not only is chopping wood a great workout, it’s a great way to save on your winter heating bill. Be sure to take appropriate safety precautions. What could be better than getting a great workout, then enjoying a cozy fire and wonderful crackling ambiance at the end of the day? Have a snowball fight, build a snowman, hit the skating rink or trudge up the biggest hill you can find to go soaring down on your sled. Whether or not you have kids, these activities are fantastic ways to get some exercise, and have a good laugh to chase away the winter gloom. Your Turn: What’s your favorite low-budget way to exercise in the winter?